Big Thunder Mountain Railroad is the runaway mine train of Frontierland located in Disney World's Magic Kingdom, Anaheim, Paris and Tokyo's Disneyland parks. This runaway mine train mixes indoor and outdoor excitement in a mildly thrilling ride the whole family can enjoy. While some rollercoaster enthusiasts might find Big Thunder Mountain too tame for their tastes, the ride is a great first time roller coaster for young children and is worth visiting repeatedly. Although the name of the fictional town changes depending on what park you are in, the Big Thunder Mountain Railroad attraction follows the same general tale. The railroad line was established to ferry gold and ore from the prosperous mine. Unbeknownst to the mine owners and railroad builders, the land was sacred to a local tribe of Native Americans and the mountain is cursed. The continuous mining desecrated the mountain, causing a devastating tragedy. The tragedy changes depending on which park you are visiting,. In Florida, it's a great flood, while in California and France, it's an earthquake forcing the settlers to leave. Later, the trains began running again without a crew or human component. Eventually, industrious settlers opened the old mining camp once more to provide visitors with a rare opportunity to ride on board the possessed trains. The design of the station and the ride mimic those of a dust-ridden and broken 1890s town. Most of the rockwork is reminiscent of the southwest landscape of the United States while the history of the ride which has notable similarities to Bryce Canyon in Utah. Disney's Imagineers took their design to the next level when putting the ride together. Rather than adding rocks, landscape and "pitfalls" to the track after they were laid, they actually sculpted the railroad tracks around the rock formations and through the tunnels. The ride speeds seemingly out of control through the rickety, unstable caverns, adding thrills by flashing light and dark. The ride uses sound effects to enhance the experience, blowing train whistles, the rushing of wind and even the sound of erupting water. Big Thunder Mountain Railroad opened at Disneyland after many delays in 1979. The Florida attraction opened in the Magic Kingdom one year later. Tokyo Disneyland added a version of the railroad in 1987, while Disneyland Paris (then Euro Disney) debuted their version in 1992. In each park, the layout of the ride is significantly different, taking advantage of local landscape and culture. 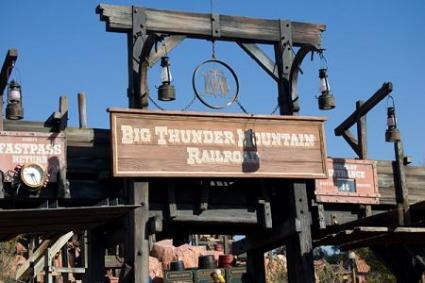 When planning your visit to Disney World in Florida or Disneyland in Anaheim, you will find the Thunder Mountain Railroad is a very popular attraction. In Florida, it is located right next to Splash Mountain. Arriving at Disney World's Magic Kingdom, you'll have to travel a bit from the main gate to get to Frontierland. You can take advantage of Disney's Fastpass system if the lines are too long either by getting a Fastpass for Splash Mountain and then standing in line for the railroad or vice versa. At the height of the tourist season, the line can be nearly two hours long. The Fastpass can save you time while you visit other areas of the park.